Here's a real fast and simple dinner, when you're not in the mood for something really elaborate. Note how the picture is pre-wrapping - somehow I absolutely always fail at the wrapping part, be it wraps, burritos or spring rolls. I just can't manage it. I think part of my problem is that I want too much stuffing in relation to the wrappings. Well. Divide the rocket on the tortillas. Add tomatoes, red onions and chèvre. Top with 2-3 walnuts per wrap, and drizzle with honey. Season with black pepper if you want to. Roll up the wraps, and grill for a minute or two in a table-top panini grill, or whatever you happen to have. True, they look really delicious. I wish I was the one that made them, but it is all Anne's cooking. I am just the messenger *vink* but I will for sure try these out. Those wraps do look great and they're so simple. Why didn't I think of that?? On my small income I could enjoy that a few nights a week! Mmm... I think I'm just looking at my next "grab-something-quick-but-good-while-I'm-working-at-home-lunch". Thanks for the tip! I actually made a version of these for lunch today. On a ciabattina, with a couple of slices of fresh picked heirloom tomatoes, sprinkled with coarse salt. Pop it under the grill for a couple of minutes, and voila, a perfect lunch! 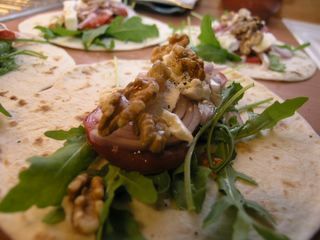 The combination of the sweet honey, sweet tomatoes, the peppery arugula and the salty cheese made it a winner!